Professor Michael Wink obtained his Ph.D. (1980) in Pharmaceutical Biology at Braunschweig University, and was Assistant Professor there until 1985. After a first professorship at Mainz University (1988/89), Prof. Wink became full Professor at Heidelberg University, where he is Director at the Institute of Pharmacy and Molecular Biotechnology. He has served as Chairman for several institutions (editor of several journals, Scientific Advisory boards). His research interests range from phytochemistry of medicinal and poisonous plants, molecular pharmacology, biotechnology to studies in evolution, molecular systematics, phylogenies and genomics. Prof. Wink has published more than 700 papers in peer-reviewed journals as well as several books and monographs. Dr. Juan José Alava is a marine eco-toxicologist and conservation biologist, working as a researcher at the Institute for the Oceans and Fisheries, University of British Columbia and Research Scientist at the Ocean Pollution Research Program, Ocean Wise/Vancouver Aquarium. Dr. Alava serves as an Adjunct Professor at the School of Resource and Environmental Management, Simon Fraser University. He collaborates with the Charles Darwin Foundation (Galapagos Islands) and is the Science Director of the Ecuadorian Foundation for the Study of Marine Mammals. He has published about 65 publications and is a member of the Academy of Sciences of Ecuador. Dr. Feduccia received his Ph.D. from the University of Michigan in 1969, and joined the faculty at the University of North Carolina, Chapel Hill, in 1971, where he ascended the ranks to become S. K. Heninger Distinguished Professor and Chair of the Department of Biology. As Chair he developed genome sciences and pioneered the UNC Genome Sciences Building. Over nearly a half century Feduccia has published more than 150 research articles and seven books, including Riddle of the Feathered Dragons (Yale Univ. Press, 2012), now in paperback. He was the first to recognize and document bird evolution's "Big Bang" following the end-Cretaceous extinctions, now confirmed by whole genome analyses. Dr. Mänd obtained a doctorate (Ph.D.) in Ecology from the University of Tartu, Estonia. Dr. Mänd is a Full Professor and Head of the Department of Zoology in the University of Tartu. He is also founder and current leader of the Chair of Animal Ecology. He has published more than 90 scientific publications. 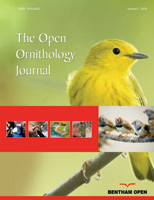 Dr. Mänd is an Editorial Board Member of this journal (The Open Ornithology Journal), published by Bentham Science Publishers. Dr. McKinney obtained a doctorate (Ph.D.) in Environmental Science from the University of Rhode Island. Currently Dr. McKinney is a Research Ecologist with the US Environmental Protection Agency and also an Adjunct Professor in the Natural Resources Science Department at the University of Rhode Island. His current research focuses on evaluating the effects of alteration of critical habitats on patterns of habitat utilization by avian species in coastal and inland wetlands. He has authored and co-authored more than 80 scientific publications. I am Dr. Jose A. Masero. I have a Bachelor’s degree in Biology from the University of Seville (Spain), and I completed PhD in Marine Sciences (1998) in the Andalusian Centre for Higher Marine Studies at Cadiz University (Spain). I’m currently working as Professor (2007-present) in the Department of Anatomy, Cell Biology and Zoology at Extremadura University (Spain). My current research interests include understanding the effects of human-induced global change processes such as climate change, water quality degradation or land use change on birds, from regional to global scales. I also have a particular interest in the underlying physiological and behavioural mechanisms of migration strategies. Most of my research is developed using interdisciplinary approaches that combine classical and new tools of field ecology with advanced laboratory methods in physiology (for example, respirometry). I am an Ecophysiologist specialized since years in the study of animal’s responses (mainly penguins and ducks) to extreme environmental conditions. This work begun by a wintering period in Antarctica to study emperor penguins in the early 80ties and further developed until now at the IPHC of Strasbourg (France). My work is mainly focused on individual quality and on the study of the adaptation to prolonged fasting and/or restricted feeding, of the stress response, of the compromise between the risk of fasting and the risk of predation. Dr. Seco Pon obtained a doctorate (Ph.D) in Biological Science from the Universidad Nacional de Mar del Plata, Argentina. Currently, Dr. Seco Pon is a Research Biologist with the Instituto de Investigaciones Marinas y Costeras, a joint venture between the National Research Council of Argentina and the Universidad Nacional de Mar del Plata, Argentina. His research interests include foraging ecology and spatial use of marine and coastal birds, and the impacts posed by anthropogenic activities (fisheries, tourism and litter). He has authored and co-authored over 45 scientific publications, including one book and two book-chapters. Dr. Gustavo Tomás is a researcher at the EEZA-CSIC, in Almería, Spain. He carried out his PhD at the MNCN , Madrid, Spain. He conducted research at NIOO, UNAM and the Universidad Técnica Particular de Loja (Ecuador). His main research interests focus on 1) understanding host-parasite interactions from the overlapping levels of physiology, immunology, ecology, and behaviour; and 2) the evolution and maintenance of secondary sexual characters, and in a more general sense, in the evolution of signals and their information content. He has published more than 60 scientific articles, and he has been included in the ISI Highly cited researchers list (Thomson Reuters) in the field of Animal & Plant Sciences. Brian Washburn earned a Ph.D. in Animal Sciences from the University of Kentucky in 2000. He has been a researcher with the USDA, Wildlife Services, National Wildlife Research Center since 2003. Brian is also an adjunct professor at Michigan State University. His research interests include wildlife stress and reproductive physiology, reducing human-wildlife conflicts, movement ecology, and habitat management. Currently, he has research projects involving a variety of species, including eagles, hawks, owls, doves, and other birds. Professor Emeritus of Evolutionary Biology Walter J. Bock taught at the University of Illinois (4 years) and Columbia University (50 years), publishing many works in evolution, ornithology and vertebrate morphology; Research Associate at the American Museum of Natural History; and Secretary (1986-1998) and President (1998-2002) of the International Ornithological Congress. Dr Johnston is a semi-retired wildlife biologist who has worked in the mining industry, universities, zoos, and with conservation NGOs. He has degrees in zoology and anatomy, and a PhD in ecology. He has held research fellowships at Ben Gurion University in Israel and the Smithsonian Tropical Research Institute in Panama. His publications include 70 books, book chapters and scientific papers. He holds honorary positions at the South Australian Museum, Flinders University and the University of Adelaide in Australia, where he is an adjunct Associate Professor. Dr. A. Margalida got his PhD of Science in 2010 from the University of Bern .Since 2013 he’s Ramon y Cajal researcher at the University of Lleida. He participate in research lines encompasing a huge range in Ecology (Behavioural Ecology, Conservation Biology, Ecotoxicology, Population Biology). He began a novel research line based on the application of bio-inspired computational models (P-systems). Applying this new method he intend to determine the key factors that affect space use, vulnerability and viability of threatened and long-lived vertebrate populations (with avian scavengers as a research model) and relationships with agro-pastoral economies, especially in relation to current anthropogenic threats such as illegal poisoning, changes in health policies and habitat alterations. My research interests include biogeography, migration, and conservation, within the context of translating the generated knowledge into pragmatic approaches for wildlife management and decision-making. Since 2014 I am professor in specialization Ph.D. courses in the University of Málaga (Spain), and since March 2017 I’m lecturer in Vertebrates and Zoology in Master and Graduate levels, respectively. Currently I collaborate with a network of international researchers to enrich my investigations dedicated to the effects of different factors in the temporal and spatial distribution of birds. Prof. Osiejuk’s received PhD from Adam Mickiewicz Univeristy (Poland) and conducted post-doctoral research (Cornell University, USA/ Paris-Sud XI University, France). He established the Department of Behavioural Ecology (Adam Mickiewicz University, 2004) and now, full professor of biology here. He is serving the editorial board of Animal Behaviour, Acta Ornithologica, Communicative & Integrative Biology, Open Ornithological Journal and Dataset Papers in Science. His research interest is in evolution of acoustic communication in animals, trade offs between design and function of acoustic signals, organisation of song variation in birds and conventional signalling. He conducted his research in Poland, Norway, USA and Cameroon. Dr. Rodríguez-Teijeiro is a professor at (Faculty of Biology) University of Barcelona. He has 40 years of experience in research and teaching. He has authored more than 150 papers and directed more than 10 doctoral theses. His research revolves around the animal behavior and its relation to ecology. Several species have been the target of their research (Common swift, Apus apus, common quail, Coturnix coturnix, badger, Meles meles, squirrel, Sciurus vulgaris). Specifically, on the common quail. His studies on this species are also directed towards their migratory behavior inquiring about its connectivity and its relation to climate change. Joan Carles Senar earned a doctorate in Biological Sciences from the University of Barcelona in 1989. He is currently head of the Department of Research at the Museum of Natural Sciences of Barcelona and directs numerous research projects in the field of ethology and evolutionary ecology. He is a member of the editorial committee of several scientific journals. The >170 scientific articles published in specialized magazines show us his path and his preferred line of research in the last ten years: the coloration of plumage as a signpost of social status and as a sexual ornament, and the role of local adaptation to understand the evolution of species. Dr. Tzschentke is doctorate in Agriculture followed by Habilitation in Animal Physiology from the Humboldt-Universität zu Berlin, Germany. Her research is focused on development of body functions in birds and its influence by epigenetic factors; e.g. long-lasting influence of prenatal temperature changes on physiology and performance in poultry (European Patent: a method for growing poultry) and malprogramming of central regulation of food intake and body weight by prenatal hyperglycaemia in the chicken model. Currently, Dr. Tzschentke is Private Docent at HU, and chair of the Working Group Physiology of the European Branches of World´s Poultry Science Association.